He's been referred to as the JRR Tolkien of Chinese literature and the grandfather of martial arts novels - but very few people have heard of him outside the Chinese-speaking world. 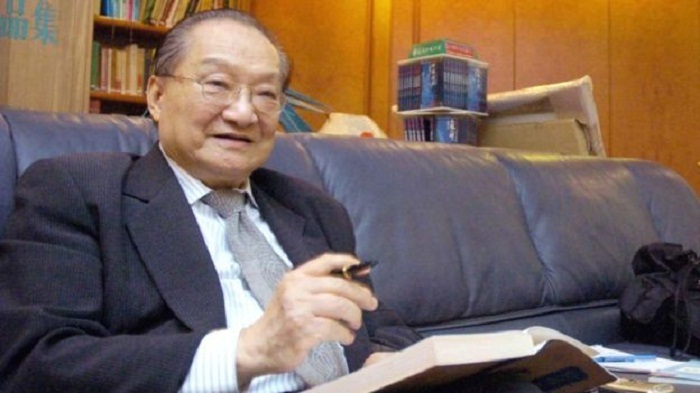 Novelist Louis Cha, who wrote under the name Jin Yong, died on Tuesday at a hospital in Hong Kong at the age of 94. "I don't think there's another writer that's been read by more people [in the Chinese-speaking world], period," Eileen Chow, a visiting associate professor of Asian and Middle Eastern Studies at Duke University in North Carolina, told the BBC. "Like JRR Tolkien, his writing has really endured." Cha was born in China in the eastern city of Haining. He moved to Hong Kong in 1948 where he worked as a deputy editor of a local newspaper. Between 1955 to 1972 he wrote 15 novels, including his most famous The Legend of the Condor Heroes - the first in a trilogy following two soldiers during a time of war in the Song Dynasty. But while his books were being published in Hong Kong, China was undergoing a huge period of upheaval. The Cultural Revolution was taking place - a period of time where Chinese leader Mao Zedong gave licence to "destroy" much of the "old Chinese culture". "During that period in China, martial arts was considered spiritual pollution, so while he was being read by people in places like in Taiwan, Hong Kong and Singapore, he wasn't as well read in China," said Ms Chow. "It was only later on that China discovered him, and Deng Xiaoping [who led the country after Mao] was a huge fan of him. And slowly he became very popular." In addition to fiction, in 1959 Cha co-founded Chinese-language newspaper Ming Pao - now one of Hong Kong's leading publications. Cha's fiction novels popularised the Wu Xia genre, fantastical stories of martial-arts heroics and chivalry. "Think of it as part fantasy, part Chinese history, part romance with magical elements, with heroes and villains," said Ms Chow. "Think of different elements from Game of Thrones, Harry Potter and Lord of the Rings. But unlike Lord of the Rings, which features a lot of non-human creatures, most of his characters are human." His novels also prominently feature female leads who are all "feisty and have lots of character". "In his books, women are not only the backdrop, they are the martial artists [themselves]," Ms Chow added. His words are also known for their poetic quality, like this sentences from The Return of the Condor Heroes. "Look at those pale clouds, gathering together, drifting apart, gathering and drifting - human unions and partings, are just the same." Tributes are pouring in from all across Chinese social media. The hashtag "JinYongDies" was viewed more than one billion times on Weibo. Many referred to a famous quote by the author: "Life is a flurry of activity. Afterwards, it ebbs away quietly." Fan art, showing Cha waving goodbye to his characters, has also been circulating online. Many reminisced about the impact Cha's works had had on them as a child. "Asking all the Jin Yong martial arts fans out there - did any of you also tie sand bags onto your legs as a child, to practice Qinggong [a martial arts technique], because of him?" wrote user NicoleClassicLife. "He shaped my entire worldview of martial arts... it feels like a figure from my childhood is gone," said another user on Weibo. Other fans expressed their love for his characters. "Looking back at Jin Yong's works, I'm surprised to find that amongst all his characters, my favourites were almost all women. That's probably because, in his world, the women were braver," one wrote. User Eunice said: "I'm now remembering those martial arts characters who we spent our childhoods growing up with! Thank you for creating so many heroes with your pen, who grew up with us. Go in peace." Authors and artists also paid tribute. Actress Yixiao Lou, who played one of Jin Yong's characters, wrote: "When I was a child, you wove martial arts dreams for everyone. When I grew up, I was lucky enough to play one of your characters. Go in peace, warrior!" "Thank you for bringing us so many classics - these brought me some of the best memories of my childhood," actress Viva Ho wrote. Meanwhile, author Amy Cheung reflected: "It's never easy to say goodbye, and there's no way of expressing how grateful I am to have met you… Cha was a Buddhist, and understood better than me how impermanent life is - perhaps I'm so sad because I simply can't comprehend that."